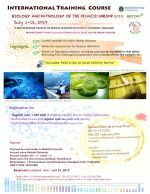 This year’s International Training Course on the Biology and Pathology of Penaeid Shrimp will take place from 1-12 July at Centex Shrimp, Mahidol University, Bangkok. Tailored to those interested in doing shrimp research or learning about shrimp diseases, you will get to learn from the very best in the field about major and emerging shrimp diseases, shrimp farm management, gross inspection and molecular diagnosis of infectious shrimp diseases. You will have opportunities to try your hand in a series of practical sessions. 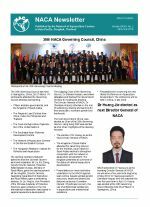 30th NACA Governing Council Meeting, China; Dr Huang Jie elected as the next Director General of NACA; Expert Consultation on Genetically Responsible Aquaculture; Launch of AGRISI: Aquatic Genetic Resource System of India; Aquatic animal epidemiology training course held at NBFGR; Asia-Pacific Laboratory Proficiency Testing Workshop; Proceedings of the FishAdapt Conference; Quarterly Aquatic Animal Disease Report, July-September 2018; Centex Shrimp International Training Course on Biology and Pathology of Penaeid Shrimp; INFOFISH World Shrimp Trade Conference and Exposition. A regional proficiency testing workshop for aquatic animal health laboratories was held from 13-14 March in Bangkok, Thailand. The workshop is part of a programme to provide laboratories with the opportunity to assess their own diagnostic performance, and improve their practices. Eight rounds of proficiency testing will be carried out over a period of four years. 34 laboratories from thirteen countries in the region are participating in the programme. The programme is an initiative of the Australian Government. Concepts and principles of epidemiology. Use of epidemiological principles in design and implementation of surveillance programmes. Sampling considerations for surveillance programmes. Estimation of sensitivity and specificity of diagnostic tests. 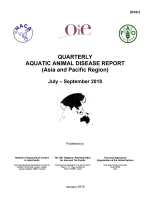 The 79th edition of the Quarterly Aquatic Animal Disease report contains information from eleven governments. 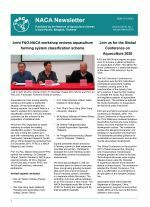 The foreword discusses the outcomes of the 17th Meeting of the Asia Regional Advisory Group on Aquatic Animal Health, held in Bangkok, 13-14 November 2018. 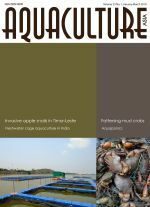 The ICAR-National Bureau of Fish Genetic Resources, Lucknow, India is conducting a School on Aquatic Animal Epidemiology and Disease Surveillance from 1-6 March, 2019. Five seats are available in the school for researchers from NACA member countries (outside of India) on first-come first-served basis. Participants should be nominated by research centres participating in NACA or by member governments. Accommodation, hospitality and meals will be provided for the duration of the training. Travel grants are not available. Please apply / express interest by 13 February 2019. The 78th edition of the Quarterly Aquatic Animal Disease Report contains information from twelve governments in the Asia-Pacific region. The foreword discusses three recent aquatic animal health consultations: The ASEAN Regional Technical Consultation on Aquatic Emergency Preparedness and Response Systems for Effective Management of Transboundary Disease Outbreaks in Southeast Asia; the Regional Consultation and Related Study on Antimicrobial Resistance Risk to Aquaculture in Asia; and the Preliminary Consultation on Monitoring of Antimicrobial Resistance in Bacterial Pathogens in Aquaculture.